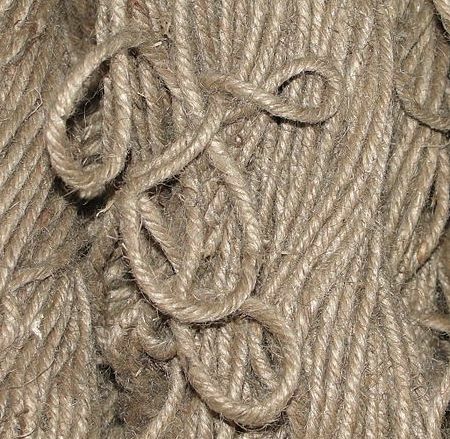 Effect: Joining two jute threads without leaving a knot. A tantrik promises to bring a squabbling husband and wife together when they are on the verge of divorce. Most Indian wives, being economically dependent on their husbands, rush to a tantrik or godman to save their marriage. To prove that he has the power to bring them together, he takes two pieces of jute thread and by incantations, the threads are joined together without any knots. Props: A 12" piece of jute thread with 4 to 6 ply. Method: Separate the plies at the centre of the thread into two equal parts and twist them separately. The thread will look like two threads. Hiding the twisted part under your palm, ask two persons to pull the other two ends. It becomes one thread as if it was one thread without any joint. Godmen cannot save a marriage. To save it, one has to keep a calm mind and think critically. Every small problem has to be critically examined to find out to what you would do if you were the other person. Only this will give you a clear solution which is the rational answer to solving a problem. Effect: Making flowers bow down. A godman from Kolhapur, Datta Bal, claimed that even plants and flowers bowed down to him in reverence because he was the avatar of Shiva. He also called himself the most scientific avatar being a science graduate. He died young a victim of hepatitis. Method: Spray the Ethyl chloride on delicate plants and flowers. They begin to droop.